Sitting round the corner from Maltby Street Market, you’ll find Druid Street Market and have these guys got it going on. 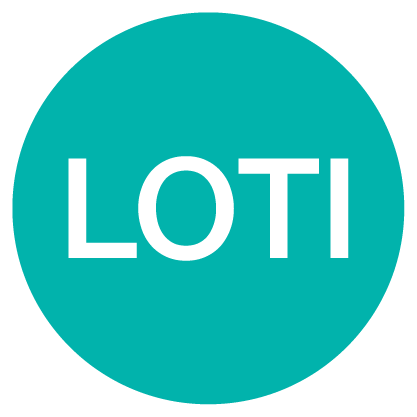 Although a relative newbie on the street food scene they’ve got some goodies on board, expect chargrilled corn tacos from Elote, thai from Ka Prow and lots of sweet treats from Fatties bakery. 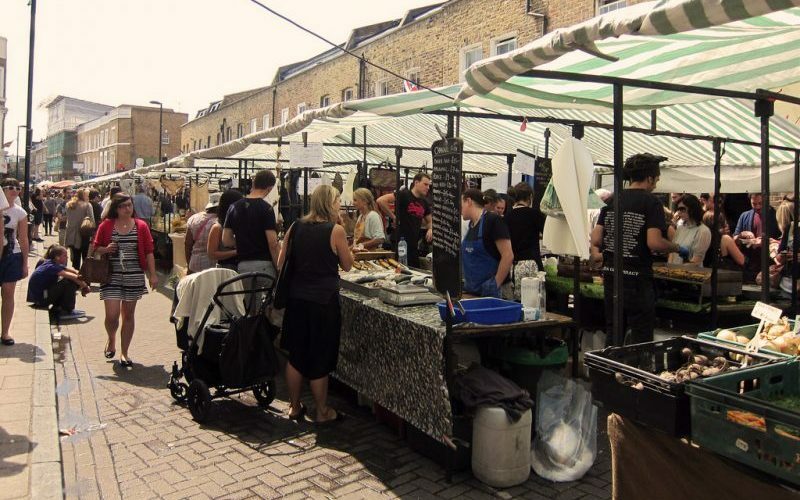 Broadway Market is one of our fave street food markets in town because you don’t just have the main street, but the school yard and Netil Market just round the corner too. And with Dumpling Shack, Morty & Bobs, Bao and probably the best iced coffee in town from Ca Phe VN, it’s well worth getting out of bed for on a Saturday morning. Berwick Street Market in Soho is one of London’s oldest markets and dates back to 1778, but it’s no longer just about the fruit & veg traders and they now share the space with some bangin’ street foodies. 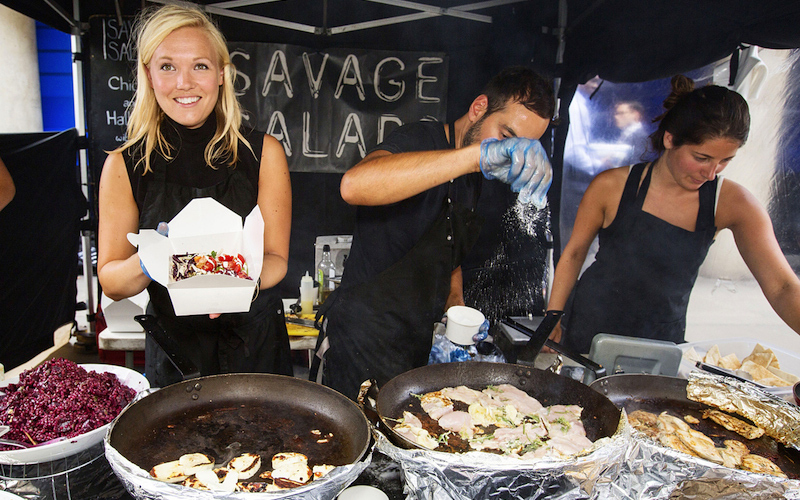 And with Tongue ‘n’ Cheek, Savage Salads and those Bubblewrap waffles, they’ve really got something for everyone. Open on weekdays, Leather Lane Market is pretty bloody popular with local workers. With an ever-changing roster of street foodies, the grub never gets boring either, but if Grill My Cheese or Daddy Donkey are on the street get in that queue! 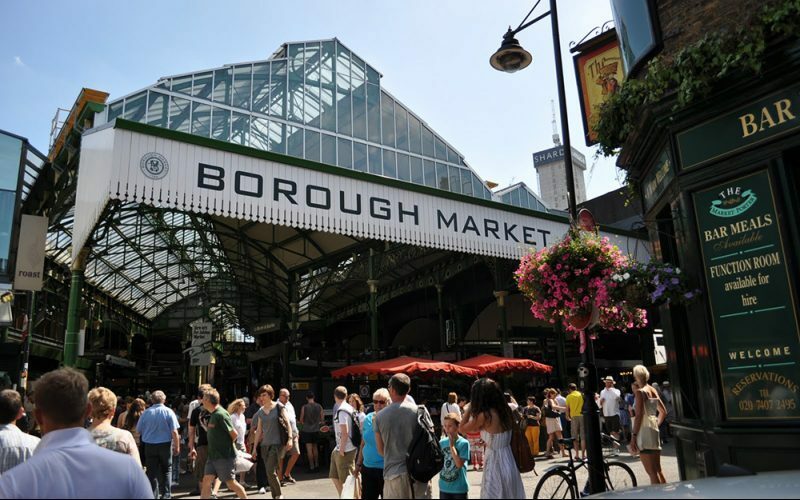 Borough Market is probably the most legendary food market in London. With Brindisa serving up their famous chorizo and rocket rolls, Gourmet Goat cooking up stews and Scotchtails bringing you the fanciest scotch eggs in town, it’s defo not just a place to pick up some veggies and fancy cheese. 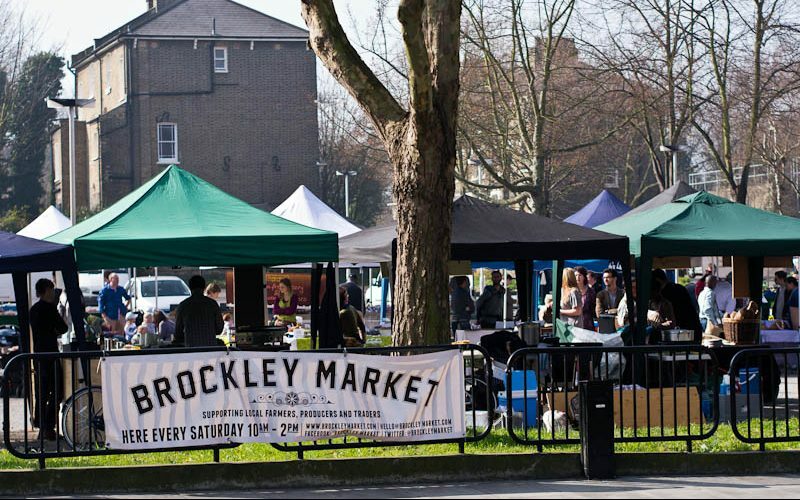 Brockley Markey might really be a produce market, but that doesn’t stop the street food traders bringing out the big guns. Let’s face it they’ve got Mother Flipper, Luardos and Van Dough – and that’s a lot more than just apples! 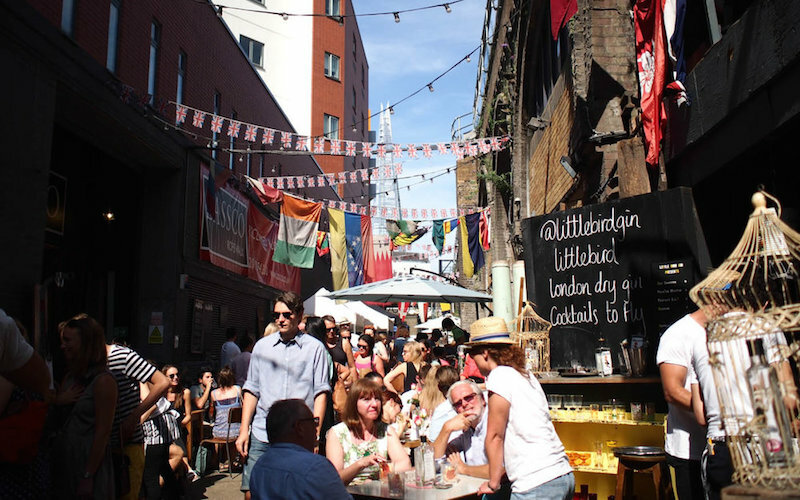 Street Feast’s southhhhhh London outpost in Lewisham is probably our fave. 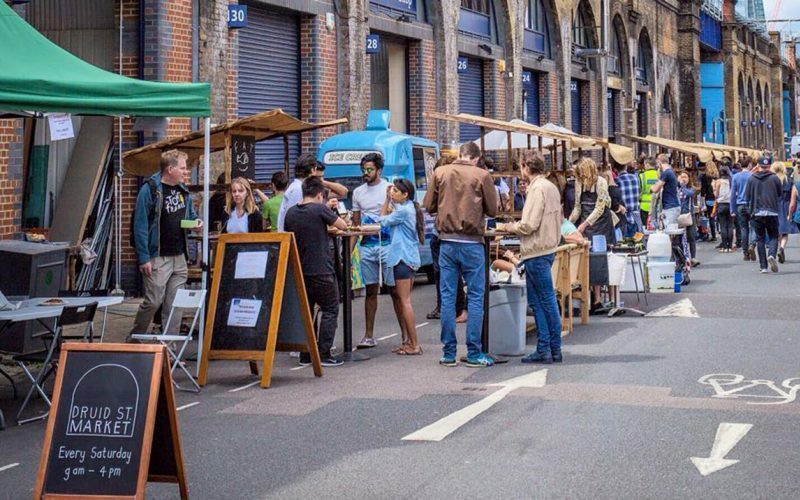 Model Market brings together some of the best traders in town with Mama’s Jerk, Yum Bun and Mother Flipper on the bill and they even have a sky high bar that’s a damn good people watching spot. 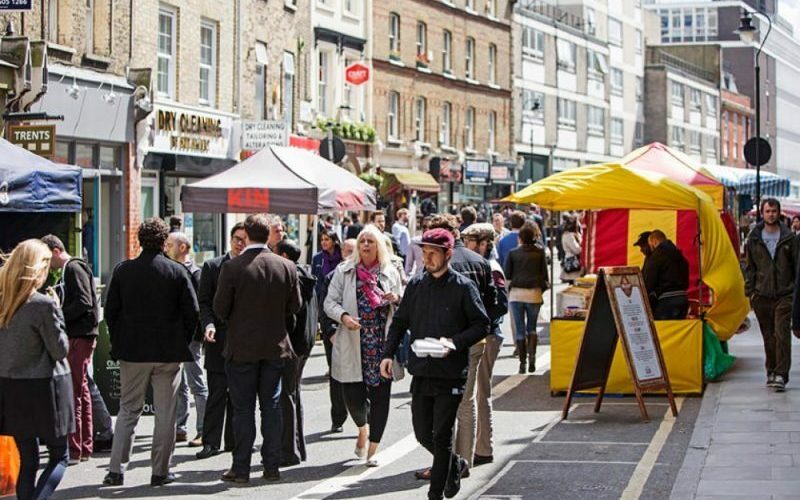 Berwick Street Market is one of London’s oldest markets and dates back to 1778, but it’s no longer just about the fruit & veg traders and they now share the space with some bangin’ street foodies. And with Tongue ‘n’ Cheek, Savage Salads and those Bubblewrap waffles, they’ve really got something for everyone. 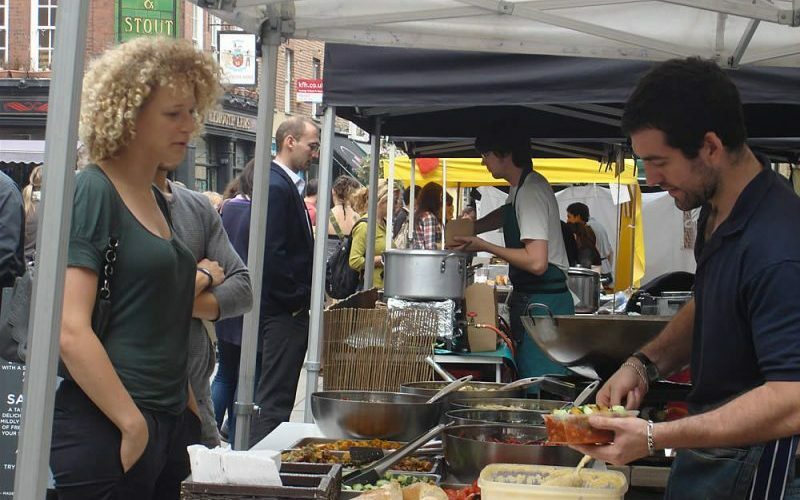 Whitecross Market gets super busy at lunchtime, but it’s no surprise with the variety of food on offer. Expect everything from Wild Game Co’s Venison Burgers and Luardos Burritos to Buddha Bowl’s veggie delights. 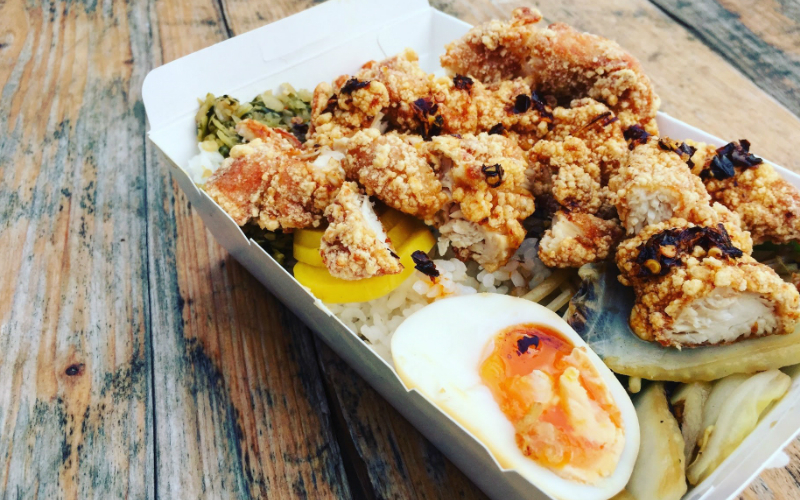 KERB has got markets all over town but their St Katharine Docks one is their biggest lunchtime one with 18 traders serving up the grub. The line-up will rotate but you can expect the likes of Bian Dang​, Only Jerkin​, Kolkati​, Vicky’s Donuts​, BBQ Dreamz​, Pochi ​and Growlers to be cooking up a storm. 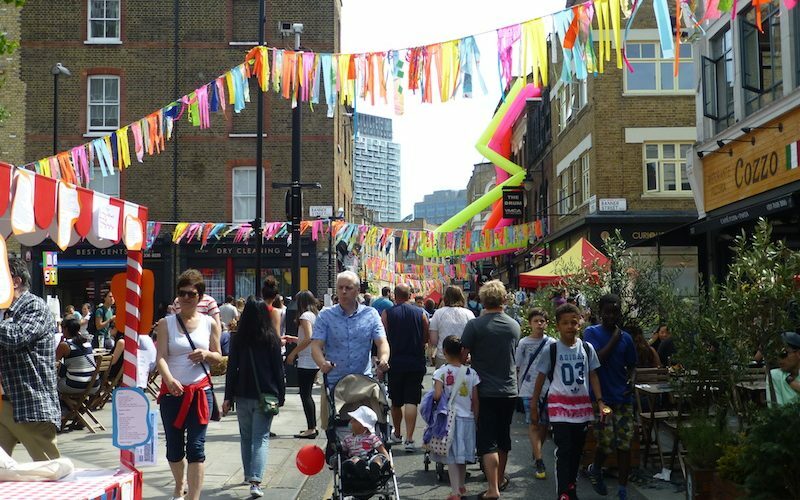 Exmouth Market runs Monday- Friday and is a big hit with office workers in the area. The stalls change regularly, but Moro and the Ghanian street food stall, Spinach & Agushi are our faves – THAT Jollof rice! 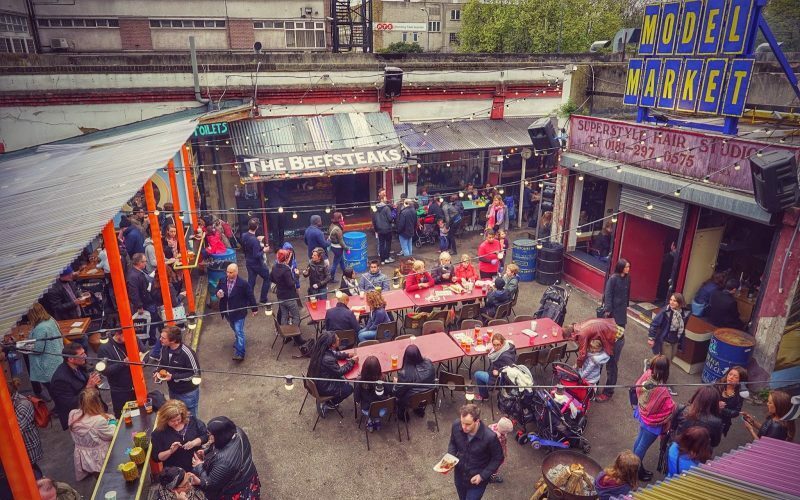 Nestled under some railway arches in Bermondsey, Maltby Street Market might not be the biggest but it definitely delivers when it comes to the food. Monty’s Deli serve up some bangin’ pastrami and salt beef sandwiches and if you get down there early make sure you get your hands on some freshly baked doughnuts from St Johns Bakery – they’ll be sold out by lunchtime! If you’re a vegan or vegan-curious, get down to Hackney Downs Vegan Market. 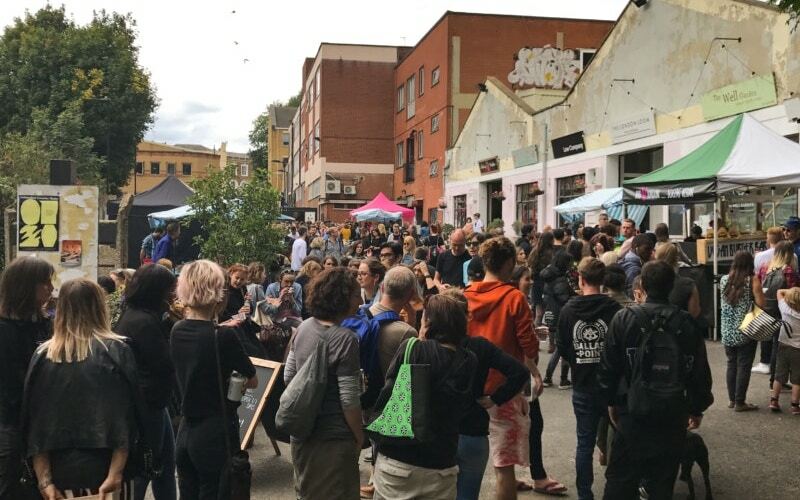 Happening every Saturday, the market brings together some of the best vegan traders out there with regulars including Temple of Seitan, Young Vegans, Dough Society and Hell Yum!